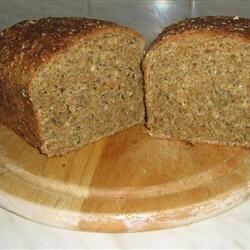 "Sunflower seeds, sesame seeds, and pumpkin seeds are incorporated into the dough of this whole wheat bread and liberally sprinkled onto the crust, giving this bread a well rounded flavor and lots of texture. This recipe is from The WEBB Cooks, articles and recipes by Robin Webb, courtesy of the American Diabetes Association." In a large bowl, combine the whole wheat flour, all-purpose flour, yeast, and salt. In another bowl, mix the seeds with the oats. In a saucepan, combine the water and molasses and warm the mixture over low heat until a thermometer reads 120 to 130 degrees F (50 to 55 degrees C) . Add the liquid to the flour mixture with the egg white. Mix together until a soft dough forms. Turn the dough onto a lightly floured surface. Knead for 10 minutes; then shape into a ball. Lightly oil a large stainless steel bowl. Add the dough and turn to cover the dough with the oil. Cover the bowl with a tea towel and let rise in a warm place for 2 hours until doubled in size. When the dough has risen, punch the dough down with your fists and add all but 2 Tablespoons of the seed mixture working it into the dough. Reserve the 2 Tablespoons of seed mixture for the topping. Shape the dough into a loaf by rolling it into a 12 x 8 inch rectangle and then roll up by its shortest end. Pinch the ends together and tuck underneath. Place in a non-stick 9x5 inch loaf pan with the seam underneath. Cover the loaf pan with a tea towel and let rise for 1 hour until doubled in bulk. Preheat the oven to 350 degrees F (175 degrees C). Brush the top of the loaf with milk and sprinkle on the reserved seed mixture. Bake the bread for 30 minutes or until the loaf sounds hollow when tapped on the bottom. Remove the bread from the pan and let cool completely. A fairly dense and tasty bread. The leftover loaf made good french toast as well.